Recessions, depression, and destroying 96 percent of the dollar’s purchasing power. Yes, the Fed’s track record is pretty bad. But the Federal Reserve is good at one thing: Creating bubbles. Like the dot com bubble and the housing bubble. And now the Fed’s massive money printing, pumping trillions to Wall Street, has created the biggest bubble of all… the stock market bubble. Since he took office, President Trump has tied himself pretty tightly to a rising stock market. He has not been shy about taking credit for it on the way up. It worked out well for him since the Dow Industrial went almost straight up in his first year. But things were a little choppy in 2018 his second year. By the end of last year the market plunged, just as we had warned. But Trump and those around him know just how precarious the stock market still is. And they know a bear market would play against them in next year’s election. If he owned it on the way up, he’ll own it on the way down whether he wants to or not. That’s just the way it works. Note how anxious the Trump team is to get the Fed’s printing presses going full-tilt. It is a frank acknowledgement that only loose money sustains this market. 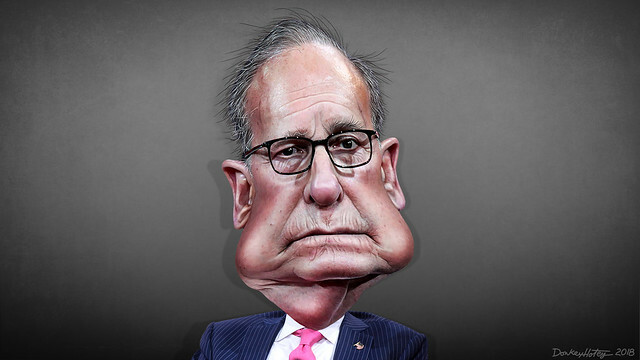 Larry Kudlow, the president’s chief economic advisor, is calling for interest rate cuts. Trump Federal Reserve Board nominee Stephen Moore has called for an immediate rate cut of half a point. Think about that. The Fed funds rate is about 2.4 percent right now. The inflation rate in March was 1.9 percent. That means he is calling for a real interest rate (the interest rate minus inflation) of zero percent. President Trump is characteristically the most explicit about the Fed policy he wants. “I personally think the Fed should drop rates; I think they really slowed us down,” he said. “In terms of quantitative tightening, it should absolutely now be quantitative easing,” he added. None of this will be enough to keep the stock market bubble from popping, no matter how much it gets juiced. You can juice a runner with something to keep him going, but not forever. Eventually he can’t be juiced any more. We survey world events — deep economic trouble in China, the European Union coming apart at the seams, trade hostilities growing – and add in a weakening domestic economy – and there is no shortage of pins to pop this bubble. You’ll be happy to have moved to gold when the air comes out of stocks. And wait until you see what happens then, even crazier Fed policies like “helicopter money” that we wrote about here, and even “Modern Monetary Theory,” the newest hyper-inflationary enthusiasm of people like Alexandria Ocasio-Cortez. We’ll keep you informed. But get out of the way.